The Friends of the Ventura River is a coalition of community groups and individuals who are working to protect and enhance the Ventura River watershed to ensure sustainability and enrich our quality of life. The coalition was formed in 2010 to build community support for the Ventura River Parkway as a long-term solution to ongoing problems with trash, human waster and other issues affecting our water quality and habitat within the Ventura River Watershed. For the past 6 years we have focused on the advancement of the Ventura River Parkway as a means to reconnect with the river and transform it into a community asset for all to enjoy. Surfrider is the fiscal sponsor for the Friends coalition which has worked to build community support for a Ventura River Parkway as a long-term solution to ongoing problems with trash, human waste and other issues affecting water quality and habitat within the Ventura River Watershed. This website is a place for friends to post their ideas, concerns, and activities and provide for a community forum about the river in our backyard. It also serves to provide transparency and to preserve the history of many of the recurring problems in the Ventura River Watershed, hopefully to guide us in making better decisions today & in the future. The Ventura River Parkway Trail was dedicated on June 7, 2014 as a National Recreation Trail. Friends’ work to enhance the parkway continues. During 2016 th e City of Ventura and County of Ventura Parks Departments worked together to install mile markers every 1/10th of a mile along the entire length of the parkway trail. 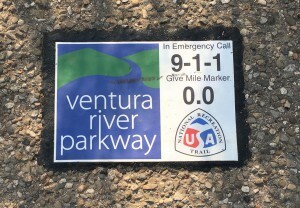 These markers as shown below feature an image of the Ventura River Parkway logo, the National Recreation Trail logo and provide your location on the trail for emergency responders find your location quickly in case of emergency. 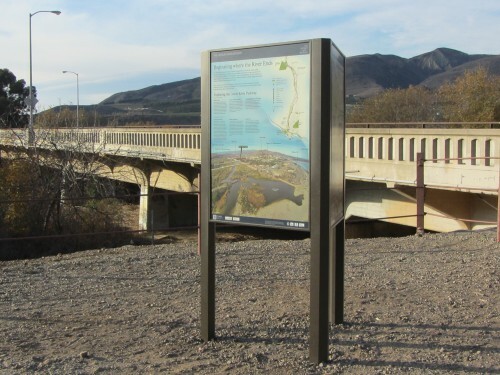 The Ventura Hillsides Conservancy has installed an attractive interpretive sign kiosk at the intersection of the parkway trail, Main Street Bridge and its Willoughby Preserve. Friends sponsored the design using money raised through Patagonia’s Salmon Run and other support. In 2016 we reprinted the Ventura River Parkway Map (Second edition) through generous sponsorships from Patagonia, the Ventura Visitors’ Center and BioResource Consultants in Ojai. NEXT FRIENDS MEETING is yet to be scheduled. The meeting date will be posted when available. Meeting agenda will be posted to Facebook and our blog when available. 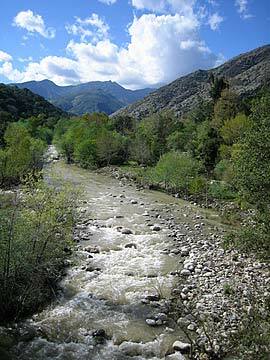 Ventura River Watershed: existing conditions, data, habitat and continuing planning efforts. in the Ventura River Parkway by volunteering to help our local conservancies with river restoration projects: Ojai Valley Land Conservancy and Ventura Hillsides Conservancy have ongoing projects on their properties in the river where volunteers can make a tremendous difference! in Ventura River Watershed planning activities: Ventura River Watershed Council. In 2014 graduate students at UCSB’s Bren School focused their thesis project on how to develop useful strategies for a plan for sustainable water use in the Ventura River Watershed. See: Sustainable Water Use in the Ventura River Watershed, for their methodology & the results of their study. stay informed on news about plans for removal of Matilija Dam. SUPPORT our Friends Coalition members‘ work on the Ventura River Parkway and other projects to benefit our community.